After an article was written regarding the classroom management app ClassDojo and its debatable use of tracking student behavior, the software company elected to delete student records annually. Teachers still have the option of saving this information after one year. This is a big move prompted by a single piece of reporting, considering that ClassDojo is used by “at least one teacher in roughly one in three schools”. One of the co-founders of this app, Sam Chaudhary, goes even further on this issue by stating that ClassDojo is “not a data company”, and instead sees its service as simply a “communication tool between teachers, parents, and students.” Singer recognizes that her initial article was not the first time concerns have been raised regarding ClassDojo’s role in classrooms. Sheninger, a former high school principal and now Senior Fellow at the International Center for Leadership in Education (ICLE) and Scholastic Achievement Partners (SAP), shares an urgent message for all administrators. He continues to be surprised at the connectedness many school leaders lack as they perform their daily duties. Sheninger considers the possible reasons, such as administrators being “unwilling to learn”, lacking the ability to “embrace significant change”, and using “CIPA (Children’s Information Protection Act)” as “an excuse for not wanting to give up control”. He also offers clear steps for administrators to brand their respective schools online and share their learning stories. After a 21 year hiatus from teaching high school history, education professor Tony Talbert puts himself back in the classroom, only this time as a student. His purpose: “to better prepare my own university students, who are studying to become teachers, for the challenges of teaching and learning in the 21st century public school environment.” During this experience, Talbert found that “a new teaching and learning paradigm had to be embraced”. He discovered that technology was not longer just a tool for students and their learning, but rather “a context for living and engaging in the world around them.” Talbert concluded that digital integration “for education is not simply for information but for transformation”. This article highlights how inBloom, a student data repository focused on making information more easily accessible for educators, lost its last remaining client, the state of New York. The reason for the downfall is due to “parents and other education activists raising concerns that student data would be exploited for financial gain or stolen by hackers”. Kamenetz points out that the process that inBloom was using to connect different data sources is similar to when we use Facebook to log into other third party providers, noting “consumers largely embrace them”. The difference between individual consumers of social media and big data in schools is the “longstanding tenet of American public education — that of local control”. In this award-winning case study, Stewart examines the literate lives of four teenage high school students that emigrated from Mexico. She found a disconnect between “their monolingual school setting” and the “out-of-school literacies” that take place on Facebook, at their workplaces, and through their home country’s entertainment media sources. Particularly within Facebook, these adolescents have “unique and purposeful roles…that allow them to connect to their home countries, maintain their Latina/o identities, acquire English, support themselves, and establish a place to succeed”. In spite of these successes, Stewart concludes that these students “will likely not graduate because of a narrow view of literacy that privileges a monolithic perspective”. She implores educators to rethink what literacy means in formal school settings so that all students have the same access to success. Someone recently posted a question on my Facebook news feed: “Thinking about starting an Instagram account. Should I go public or private?” The screenshot above of my own Instagram homepage highlights the impressive visuals that are the hallmark of this social media tool. Many of the people she had friended on Facebook unanimously voted for private in the comments. Never one to shy away from a debate, I chimed in with the reply, “Public, because there is no such thing as privacy online.” There was some contradiction in my statement, as I posted this comment from my own private Facebook account. So what is really private when we share ourselves online, both professionally and personally? There will always be risk involved whenever we use these types of mediums for promoting a message. As adults, we can make a conscious choice to post or to not. The students in our classrooms may not, especially if they are at the whim of an uninformed educator’s choices. Assigning blame for poor practice to a digital tool such as ClassDojo does not excuse our instructional decisions. We should always think of the students first in our plans. Before posting anything with young learners involved, ask yourself, “Will they mind seeing this online 20 years from now?” If we are unsure about the answer, it is better to be safe than sorry. On the flip side, when we prevent any online communications from entering our classrooms, are we depriving our students of essential learning experiences? According to Eric Sheninger, Tony Talbert, and scores of other connected educators, most certainly. The case study of the Latina/o students is just one of many instances where the gap in relevance between school and the reality of our youth’s learning lives is too large. So how do we overcome these fears of the unknown and start showcasing our students’ learning journeys? One way is to follow Talbert’s footsteps, becoming students ourselves to understand how technology may have become a context for learning, rather than just a tool. Another way is to become connected ourselves. If all we ever read about technology are stories like inBloom’s demise, we lack the necessary perspective that is so easily accessible to us via social media. Reflecting on my own path toward becoming more connected, Twitter was an excellent start. I followed smart educators, as well as the hashtags in their posts, such as #cpchat (Connected Principals), #educoach (Instructional Coaching), and the general hashtag #edchat. These professionals continue to share their thinking and important links to online articles and blogs. The more we experience this type of learning, the better we understand its value in education, for both students and ourselves. The benefits of thoughtfully sharing learning online and making connections beyond our school walls can outweigh the risks. In these situations, anything we post may be front page-worthy. This post starts by profiling author J.K. Rowling and her penchant for writing in coffee houses. Rowling finds that these locations allow her to see where her writing takes her, without constraints. Campbell identifies the many benefits of this type of environment (connected, comfortable, choice, space, music) that could be applied to schools. He describes classrooms of the past as “a cross between a hospital operating theatre and a Viking longboat”. Campbell, a 5th grade teacher and writer, helps the reader recognize that the modern classroom has changed drastically, and encourages educators to follow suit by developing learning environments where students can “learn how to think creatively and solve problems innovatively”. 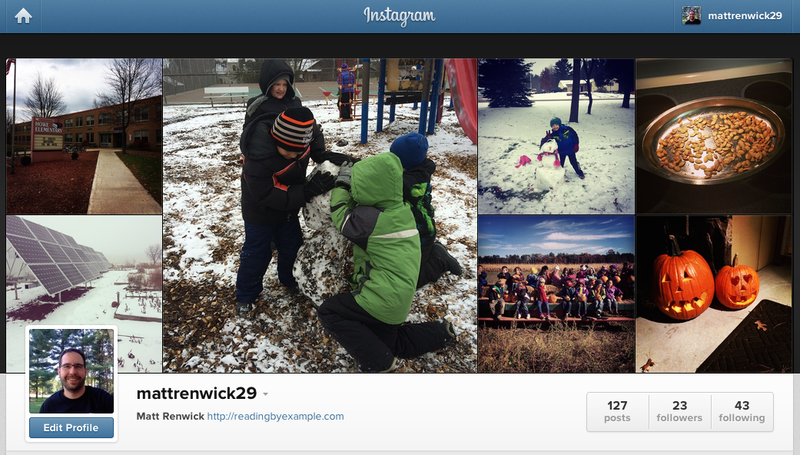 This 1st grade teacher highlights a new app that allows students to more easily post on their blogs. Her purpose in sharing is to show how simple it is for students to share their learning with a broader and authentic audience. Easy Blog Jr. and Easy Blogger Jr. give learners a more streamlined way of sharing their writing online. Cassidy offers several screenshots of how this app works. The multiple benefits featured about this technology appear to make it a worthy purchase. The author starts this article by noting that technology is not the answer to what may ail education, while still acknowledging how the digital world can augment and even redefine student learning. Conradi outlines a number of steps in integrating these new tools into classrooms. She starts by suggesting teachers “figure out precisely what motivates different invididuals”, followed by determining the type of motivation that students need, differentiating between “self-concept and attitude”. Conradi documents the decline in student motivation for reading as they progress through the middle grades. To remedy this, she recognizes how the social aspect of technology can provide for “opportunities for discussion and collaboration” among older readers. In addition, allowing students “the possibility of shared written, multimedia products with a global audience” can provide learners with “purposeful opportunities to engage with literacy”. Last year, one of our teachers and I facilitated an after school computer club for students. Our question: If we gave students access to technology, would learning naturally occur? The inquiry was not resolved with a simple yes or no answer. Yes, students enjoyed using apps such as Minecraft to create complex worlds, as well as to work with others in developing their creations. Just as frequently, kids would struggle to follow the ground rules for these online interactions. One way the teacher and I resolved these conflicts was by removing the technology and replacing it with Lego Mindstorms, as you see in the above photo. 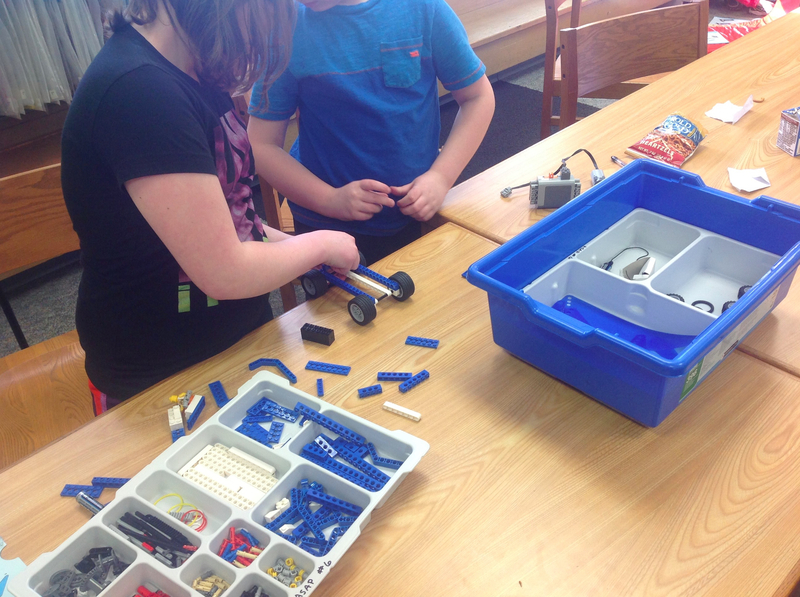 While our action research might seem haphazard at first glance, we did have a plan in mind. We were looking for various levels of engagement, what work students produced, and the type of collaboration that would occur in digital environments such as Minecraft. That it did not go as well as anticipated, and how well students transitioned away from the technology-reduced learning environments, should be celebrated. This example may be what all the above examples have in common: Educators who put more time into preparing for powerful learning and students’ needs, and how this compares with simply putting in the requisite amount of effort and energy to plan for just-good-enough instruction. Whether it is recreating a classroom to make it more like a coffee shop, or implementing project-based learning, it is the design that determines learning environments and allows teachers to teach. When these factors are considered prior to instruction, teachers have access to more teachable moments because students are more likely to be engaged in deeper learning. It allows the teacher to provide more feedback to students, instead of being sequestered to the front of the room. Having access to technology, whether as readers or writers, demands similar amounts of preparation for learning outcomes. My biggest takeaway from these articles is that the amount of time teachers put into preparing for instruction is directly related to how students at all levels are engaged in the learning. In conclusion, learning is more dependent on what happens before the lesson actually starts as when it actually begins. Planning for specific outcomes and preparing for what is possible may be the difference between good and great teaching. With the advent of the smartphone, landlines are starting to become a thing of the past. But what about television? Williams provides a close perspective of how millenials are moving away from the community screen. In its place: Laptops and tablets. Media is consumed via subscriptions and one-time purchases within this format. While some lament the lack of physically being with fellow viewers, others note how socialization still occurs in the privacy of our own screens. For example, many fans of popular shows such as “Scandal” connect with each other via Twitter, commenting on each episode while it is live. This collaborative post was written in response to a piece by highly respected literacy expert Nancy Atwell. She referred to iPads in the primary classroom as “trendy” and “a mistake”. Troy’s and Kristin’s response is thoughtful, balanced, and convincing. They do recognize the importance of moderation with technology in the classroom. However, the number of examples they list that incorporate digital tools effectively is impressive. For example, Kristin’s students use the app Book Creator on iPads to create original eBooks with audio narration. They can be stored in the device’s iBooks library, which stand side by side with other titles from major publishers. This research study conducted through the University of Maryland wanted to determine the correlation between classroom supports, student motivation, and informational text comprehension. Guthrie and Klauda specifically looked for outcomes related to the presence of student choice, conveying the importance of reading, collaboration, and perceived competence in the classroom. They facilitated these elements of instruction within the Concept-Oriented Reading Instruction framework. History at the secondary level was the context in which this study was conducted. The researchers found that when students were provided with these specific supports, they better “persevered in unraveling complex texts”. Students also increased in the amount of value they attributed to “the importance, benefit, and usefulness of reading”. Comprehension was subsequently stronger when compared to more traditional instructional methods. Dr. Ivey, a literacy professor at the University of Wisconsin-Madison, is an acolyte of John Guthrie. In this summary of her own research on student engagement, she set out to determine how to normalize an authentic reading culture within a high-poverty school environment. The teachers in this study put few requirements on their students regarding their reading – just read high-interest texts, talk about their reading with peers, and then read some more. What they found was students not only became better readers, they also became better people. 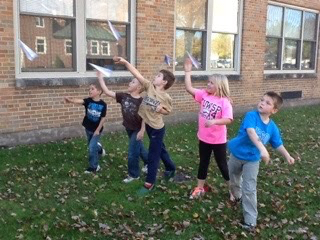 Through the world of fiction, students learned about “working on relationships, both with others and themselves”. They also discovered the skill of “taking up perspectives” and residing within the characters in their books. This led to students increasing their capacity for empathy. Where as some educators might worry about the accountability of students not being required to complete a reading assignment, Ivey found evidence to support the notion that students looked “to further complicate” their thinking by asking questions of peers and demonstrating reading comprehension. Students “turned toward each other” in their learning. Mindfulness, or the purposeful act of being present, has been a hot topic in education lately. McKibben highlights the research that suggests using mindfulness strategies, such as breathing techniques, can “improve cognitive performance” and increase “resilience to stress”. Educators profiled for this article acknowledge the resistance that parents might have with these practices. They suggest family education prior to implementing mindfulness activities schoolwide. Also important is that educators teaching students how to be more present in the present should model these strategies themselves in their daily lives. The image at the top of this post is of my son and some of his classmates celebrating a reading activity. Where are the books? you might ask. They just finished a project for the Global Read Aloud, an online literacy event created by Pernille Ripp (@pernilleripp). They recently read the book I’m Here by Peter Reynolds. Motivated by the theme of friendship in the text, they made “friendship planes”, which contained original suggestions by the students on how to be a good friend. Attaching their learning to a meaningful concept helped the students connect their reading to a bigger idea. What made the kids’ day was the author himself commented on the classroom blog that contained this image. In my humble opinion, this is a wonderful example of engagement. The teacher captured their hearts and minds by appealing to something important to her students (friendship). She then connected this concept to reading and writing in authentic and meaningful ways. There was a tangible impact on their lives, both socially and emotionally as well as cognitively. Later on, my son and his classmates may not recall the exact text they read during this event. However, it is more likely they will remember how it made them feel and how this experience helped each of them become a better person. Without tapping into the emotions and excitement for the subjects we are teaching, our instruction will fail to meet its learning potential. We can require work as much we want, but if our students are not engaged in the learning, what they produce is more likely a result of compliance. It’s one thing to point to the board and read aloud the learning target at the beginning of the lesson. It’s another thing to present a thought-provoking video or image, or to ask a provocative question that forces learners to think deeply. This type of engaging instruction creates its own sense of mindfulness. Technology can help make these types of activities possible, but only as a way to support the learning and not lead it. Digital experiences are not a panacea for all that is lacking in education. Nothing can replicate the face-to-face social experience. Technology is only a tool, albeit a powerful one, for learning in the classroom. At the same time, we should not deny the impact that it has on learners. To dismiss this influence would reflect our ignorance of these possibilities, instead of a broader understanding of its impact on our students’ learning lives. In our upgraded roles as teachers in the 21st century, we would be wise to regularly rethink how we are most effective in engaging our students in new learning possibilities. 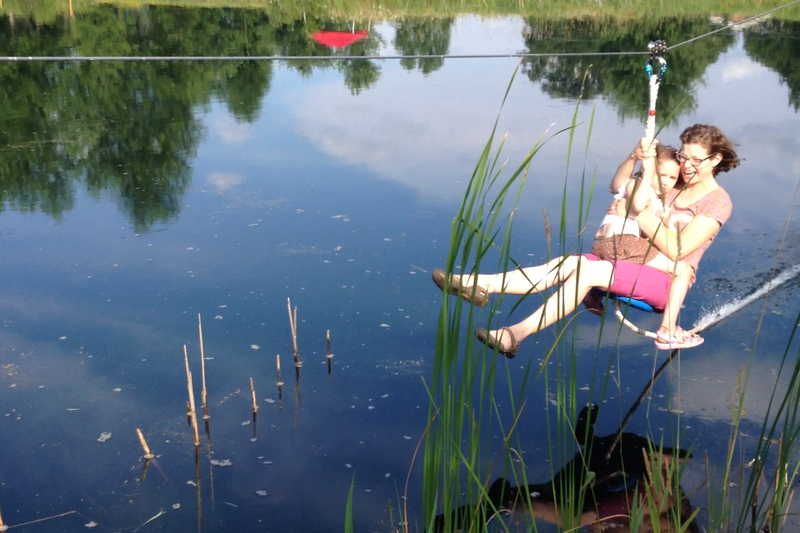 My wife and daughter ride a zip line across my physical education teacher’s pond. A New York City educator with an impeccable teaching record was recently given a low rating by the state’s evaluation system. The reason for the discrepancy appears to be the use of value-added measures, or VAM. They compare this year’s standardized assessment results with past year’s students, as well as other grade level learners. The article notes that this method of evaluation is less than reliable, a position supported no less than by the test developers themselves. In the past, other quality educators have received low ratings with VAM. The difference here is both her prinicipal and superintendent wrote letters in support of this teacher and questioned the validity of the results. The outcome of this lawsuit may have a large effect on other states also using similar evaluation models. The title for this article immediately caught my attention. A charter school in New York City has observed marked improvement in their students’ tests scores, primarily in mathematics but across the board in all core academics. The set up is nothing if not interesting: few administrators, teachers getting paid over $125,000, and daylong auditions for teaching candidates looking to land a job in this school. The faculty also participates in peer observations weekly to get feedback on their performance. So what’s the catch? There are larger class sizes to allow for more professional development time. Also, the staff is expected to work longer hours, which most teachers already do. I think the biggest red flag for me was the fact that this school has a 47% attrition rate. After reading this article, I felt there were too many variables to determine what really led to improved student achievement. In this study, researchers analyzed the impact that eBooks with visuals and built-in word supports might have on students’ understanding of key vocabulary. What they found was students benefited the most from words that were noted and attached to dynamic (animated) visuals. The researchers, from Israel, provided necessary background knowledge in the published study about cognitive load. Readers struggle to comprehend the text if there are too many pieces of information to attend to. The results shared here are worth disseminating to classroom teachers, as they consider apps and eReaders for the classroom. Does the technology get in the way of the learning, or does it augment the experience? This article was selected for a close reading with my entire staff during a recent professional development day. It describes a protocol that teachers can use with students to find the main points (M), visualize (V), or find a phrase that stays (P). The acronym “MVP” provides a nice association for students who are familiar with its more common usage in the sports world. After our day of learning, multiple teachers let me know that they found the strategy described in this article to be very applicable to their areas, whether primary, intermediate, or as a specialist. When my wife and daughter decided to ride the zip line across my physical education teacher’s pond, there was some decision-making that occurred before they hopped on the rope. For example, would the thrill of the experience outweigh the possibility of falling in the water? Obviously, they said yes. But their was safety in this risk. The water was determined to be fairly clean. People were on both sides of the pond, ready to jump in should trouble arise. Safety precautions were reviewed beforehand. The environment created for this experience made it that much more likely that my wife and daughter would participate and be successful. My purpose in telling this story is to explain the conundrum education currently faces with these new teacher evaluation systems. Yes, every student should have access to a great education, every year. Systems should be in place to help ensure quality. But is assessing a teacher’s effectiveness by using test scores and value-added measures the best way to do this? I say no. Beyond the fact that the results are unreliable, when we publically rate teachers, we create a climate of competitiveness instead of a culture of collaboration. Will professors, and K-12 educators in general, be open to sharing their coursework with students and the world? Will teachers be willing to apply the MVP stategy in their classrooms, knowing that their initial efforts may not pan out as expected? Will teachers experiment with different reading experiences on tablets and eReaders, and risk the time and possible loss in instruction inherent with action research? We should not stifle creativity in the name of accountability. Our efforts to control the outcomes with education can often detract from the very same results we look to improve. At the same time, creativity and accountability do not have to be mutually exclusive. Steve Jobs did not get fired from Apple because of his lack of knowledge, or an inability to create a great product. His initial failings had more to do with his lack of trust he had in his colleagues. When he came back to Apple, he was more inclusive in acknowledging others’ ideas and gave top performers some latitude and leadership roles. Not that he wasn’t still obsessive about the products produced. He just learned to hire great people and allow them to reach their own potential. How can we create learning environments where risk is rewarded? That is the essence of research. Disappointing results can be just as helpful as a study that leads to success. But when our students’ test results are tied to our evaluations and even our pay, little innovation is possible. The outcome will be instruction that lacks the essential elements necessary for learning to occur – time, trust, relationships, and connectedness. With that, one of my most important roles as a school leader is to create a learning environment with soft landings, lots of supportive people, and permission to innovate. Only then are the rewards attainable. Regie Routman writes a very pointed commentary about the educational world’s infatuation with standardized tests. She admits that it is possible to raise assessment scores with lots of preparatory work, but the results are “an achievement mirage” which do not truly reflect a school’s collective ability. Routman calls upon school leaders to avoid such an environment, and instead focus on what works for teachers and students and motivates the entire school to make admirable achievements. Developing trust, modeling best practice during staff meetings, advocating for authenticity in instruction, and “focusing on what’s most essential for students” are some of the most important tenets of school leadership. Routman closes our her article by pointing out the contradiction that when “principals and teachers are expected to have a laser-like focus on test prep and raising achievement, they actually teach worse, not better.” This concluding statement should give every principal pause as they start to prepare for the new computerized assessments coming our way. Speaking of computers, Julie Smith shares her perspective on schools migrating student work and information to cloud-based servers. She acknowledges that reduced budgets are a main driver in moving toward online providers. The question still remains: How does this impact student learning as well as the bottom line? One major school district, Indianapolis Public Schools, has merged all of their student information systems into a unified cloud. Student data, lessons plans, and completed homework are a click away. These capacities can lead to improved access to content and more responsive instruction. Other districts, including mine, have embraced Google Apps for Education for their email and document storage. However, risks are inherent when using third party applications. This is a reason why the state of Illinois has created the public-controlled IlliniCloud, which allows for more of a walled garden. In this very accessible article, Grierson interviews social scientist Ellen Langer about her past and current research on how environment and mindset can impact not only a person’s attitude about themselves, but also their physical health. In an earlier study, Dr. Langer had several seniors spend a week in a residence that was retrofitted with reading materials, television shows, and everything else a home may have had 22 years ago. Oh, and the participants had to pretend it was that period in time. After one week, her team recorded marked improvement in many areas of their subjects’ health, such as blood pressure and dexterity (confirmed by the fact that the seniors broke out into a game of touch football on the last day). It appears that a person’s mindset may impact not only their brain, but also their body. What is Dr. Langer’s next inquiry? This coming spring, she plans on replicating her earlier work, only this time taking cancer patients to a remote tropical area and housing them in an environment that predates their initial diagnosis. I look forward to reading the results from this study, and hoping that the subjects find positive results from this provocative experiment of mindset. In an equal impressive commentary from the same issue of Education Week, Andy Hargreaves echoes Regie Routman’s assertions that trust and lifelong learning are the cornerstones of a successful school. Focusing on the individual teacher from a statewide-perspective will not improve learning. Instead, “organizations need more and better leadership that is responsible, inspiring, and effective.” Hargreaves has profiled many successful organizations in and out of education. The common thread he has found is what he calls “uplifting leadership” in these organizations. “These leaders uplift the opportunities or quality of life of the people they serve.” The four trends teased out from his observations of these organizations – a strong mission, an original focus for their work, collaboration, and meaningful data – have direct applications to schools. In a recent post on my original blog, Reading by Example, I shared that I did not have the words to respond to Time’s cover article about getting rid of bad teachers by removing tenure law. Luckily, we have Mark Barnes. He sounds off on many of the less-than-sound arguments made by Time journalist Haley Sweetland Edwards. Barnes accuses the magazine’s cover of being misleading, notes the cherry-picking of the bad classroom practices as examples for needed reform, and derides the poor choice of profiling a Silicon Valley millionaire as the next great leader in educational change. Campbell Brown and Nancy Gibbs attempt to mediate the uproar with follow up statements, but admit little to no fault with the original report. Certainly, there is a need to improve classroom instruction so there is better consistency from school to school. But as a principal, I can attest that getting rid of tenure will do little to make that happen. 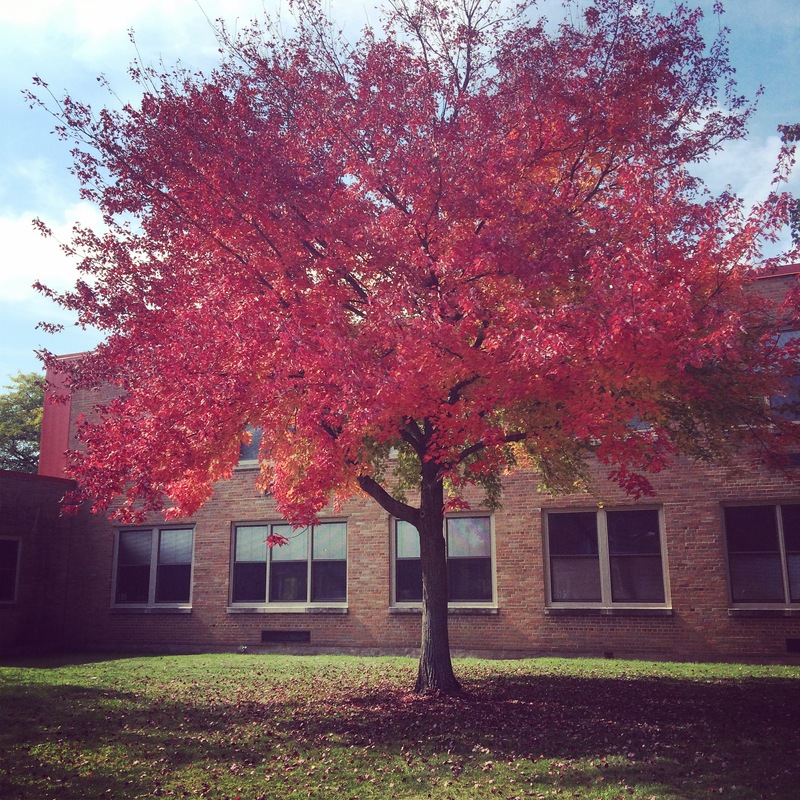 The image of the changing leaves can be a powerful metaphor for our lives in education. From buds, to green leaves, to full color, to falling on the ground, and repeat. We seem to keep coming back to original mistakes that we have made, and obviously not learning from them. Now in my sixteenth year of working in public education, I have been around long enough to see ideas cycling back. What Regie Routman and Andy Hargreaves propose are not new. They have been pushing these sounds ideas of effective school leadership for many years. That their messages might seem new to certain readers says more about the reader than anything the authors propose. The topic of environment specifically related to one’s mindset is critical. As you read in Dr. Langer’s study, what a person perceives as reality can literally become their reality, both emotionally and physically. These findings have strong implications for the classroom. How do your students feel about themselves as learners? Are they excited to come to school each day? Are we? We cannot change the circumstances that inhabit our students’ homes, nor significantly alter the tired political conversations promoted by questionable sources such as Time. But we can impact each child every day, through the joy and engagement found with exciting and thoughtful instructional preparation. Our season of change also seems to be accelerated with the influx of technological “solutions”. We may be experiencing faster-than-normal cycles due to the steeper learning curves with digital access. But the cloud-based learning examples reported by Ed Tech Magazine are still in development. Despite what technological or political factors may come our way, we still have the control, as well as the obligation, to provide our learners with the skills and dispositions necessary to be successful today and in their future. I doubt that what we elect to focus on will be outdated any time soon.